Parses an input into its file name, extension, path, and the last workspace name. The output can be used as an inline variable in the output name of other tools. More than one variable name can be added to create unique names for the output, for example, C:\Temp\Out_%Name%_%Workspace Name%. 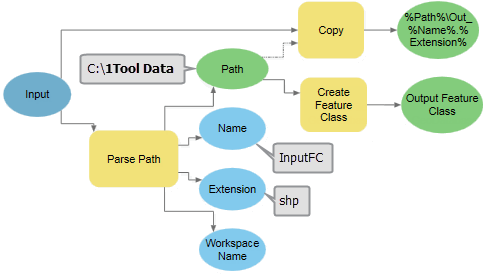 The Path output of Parse Path has a workspace data type and can be connected directly as an input to the Create Feature Class tool's Feature Class Location parameter, which accepts a workspace data type as input. For tools such as Copy that do not have a workspace data type parameter, the Path value can be passed to the tool using inline variable substitution such as %Path%\Out_%Name%.%Extension%. The input values to parse. Path—The output will be the file path, for example, C:\1Tool Data. Name—The output will be the file name, for example, InputFC. Extension—The output will be the file extension, for example, shp. Workspace Name—The output will be the workspace name, for example, _1Tool_Data. The workspace of the input. The file name, excluding the extension.